The folks behind Plex have managed to get the their media organization app on to just about platform including all of our tablets and PCs along with Xbox and PlayStation, among others. The company has also been steadily updating the app across many of the platforms it exists on including recently adding full audio library support. One platform that is long over due for a refresh is the Roku streaming devices, and today the company is announcing the “next-generation” version. Plex’s previous Roku offering was in some ways too simple and basic compared to other platforms, but the latest version will sport a brand new look and a deeper feature set. Plex is much more focused on presentation this time around with large cover art and a better layout in general. The company has also put a stronger focus on discoverability plus the addition of cinema trailers, Plex Companion (remote control) and Plex Home. While certainly a step in the right direction, the new update is missing a few major features still like photos, playlists, a basic search, support for SD resolution content, and channels. Plex lists them as “coming soon” at this point. Only Plex Pass subscribers will get early access to the new app starting today and you’ll find a complete list of instructions on how to do so here. 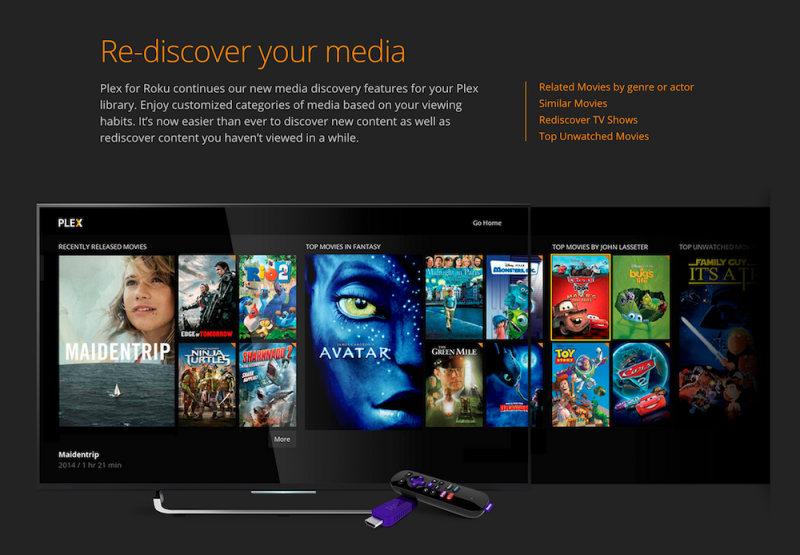 The new app is supported by Roku 1-3, Roku Stick, and Roku TV.